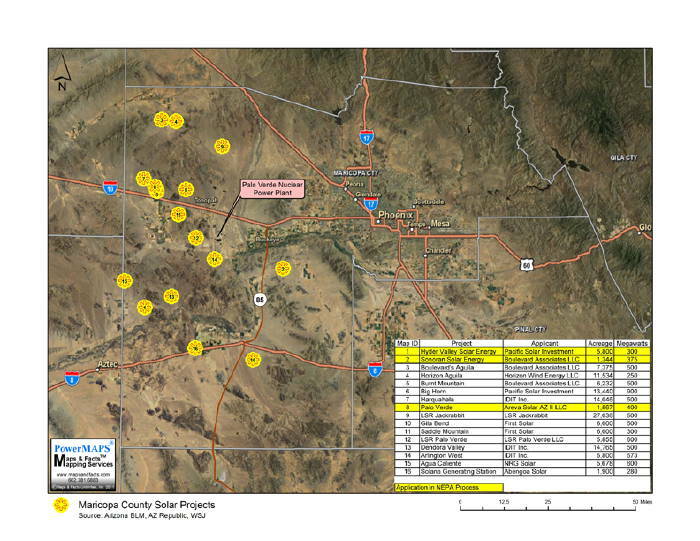 Map Samples - 2011 Maps of the Month - Maps & Facts Unlimited, Inc.
On a recent appraisal/consulting assignment we were amazed at the number of potential solar projects just in (western) Maricopa County. We have no idea how real each of these proposed projects is; but according to public records as mapped, 135,000 acres, 210 Sections, or almost 6 Townships are in play. The first complete examination based on AIMS ( Arizona’s Instrument to Measure Standards) testing was given in 2002. This month’s map compares 2010’s high school performance with 2003’s. As shown, comparative high school rankings haven’t changed in 8 years. However, the 3 lowest ranking high schools (based solely on AIMS test scores) have improved dramatically with at least 50% meeting or exceeding the standard in 2010. The flip side is that, over 40% have not. 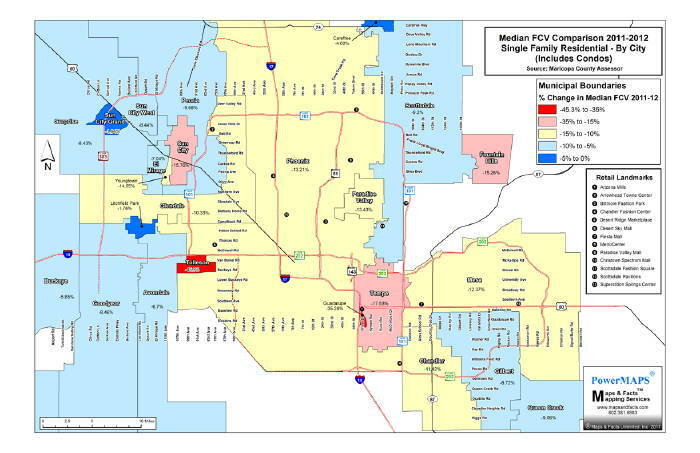 This month’s map depicts the reduction in Maricopa County’s median Full Cash Values (FCV) by city. This doesn’t mean your taxes will go down! Your taxes are a function of both FCV and the budgets necessary to run our governments. It is also important to recognize that these Full Cash Values are based upon transactions, including REO (Real Estate Owned) prior to January 1, 2010. The appeal deadline for administrative appeals is April 26th. Alternatively, a property owner can appeal directly to the Arizona Tax Court by December 15th. 10,000 Home Sales in March! ARMLS reported there were 9,996 house sales in Maricopa and Pinal Counties in March. A welcome and positive showing. 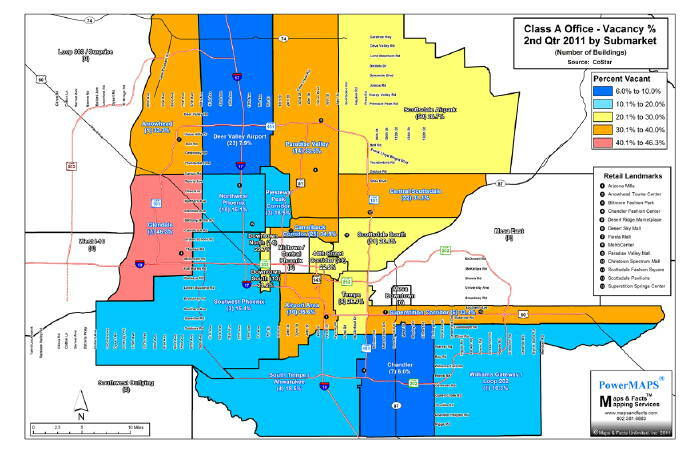 This month's Map of the Month shows where the most sales are located based on Maricopa County Recorder records. All price ranges were comparatively well represented, ie: from $5,800 to $4,000,000, and, all parts of the Valley were active. From time to time friends and clients ask: Why we track residential data including our 20 year running “ Best Schools / School Performance Maps”? Other than the data's educational interest, we consider comparative school test scores to be an indicator of broader indices and trends at the submarket level. 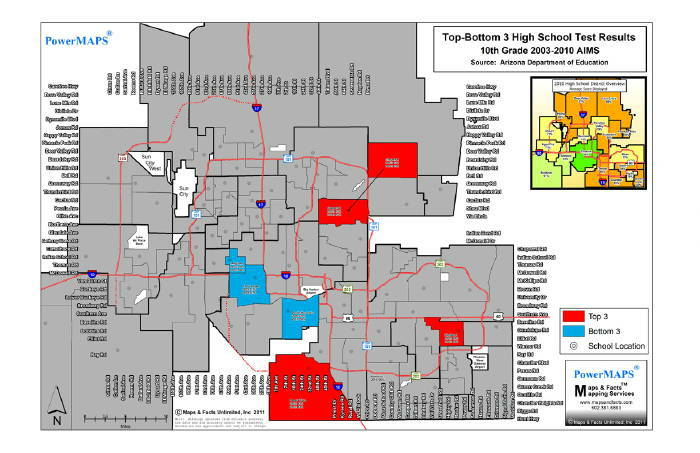 This months Map of the Month highlights Median Household Income within selected high school attendance boundaries. As shown, the high schools with highest AIMS scores also represent sub-markets with high Median Household Income. Conversely, and unfortunately, high schools with the lowest AIMS scores represent submarkets with low Median Household Income. Our point is that there is a high correlation between school performance and other non-residential data including commercial real estate prices, rents, occupancy, absorption, marketability, capitalization rates, financing, crime rates, and more. This month’s map depicts the change in median Full Cash Values (FCV) from 2008, the peak tax year, to 2012 the most recent year. 2. But, real estate taxes do not go down! The tax rate is adjusted to offset decreases in FCV. All things being equal, if the budget stays the same, and if FCV remains the same, individual property taxes will remain the same. 3. At MAPSANDFACTS.COM we have a chart depicting median FCV for each year from 2006 through 2012. While not a paired or repeat sales database, it is a gross proxy for changes in value. It is always fascinating to observe the stock market. After each quarter, publicly traded companies report their earnings and the market reacts overnight i.e. : Apple vs. BAC. However, there is always a story behind each and by the next quarter the stars will have aligned differently! Real Estate appears to do the same. The July 27th Wall Street Journal, Business Day (Page B-6), discusses how the classifications of office buildings in Manhattan (Trophy, “A”, “B”, & “C”) vary from firm to firm, and implicitly geographically and quarterly, making most historic comparisons perilous. Like the stock market, real estate observers have to look at the bigger picture over time. This month’s map depicts CoStar’s Class “A” 2Q 2011 office vacancy rate by submarket and number of buildings showing this quarters “Apple's”, i.e. Chandler/Deer Valley; and “BAC's”, i.e. Glendale. However, Valley wide the Class “A” office vacancy rate hasn’t changed from 2nd Quarter 2010: 25.1% vs. 24.9% in 2011. We shouldn’t get excited about a trophy “recovery” until market wide occupancy increases over at least several quarters in multiple sub-markets with corroborating support from jobs and net population (household) increases. So far, total occupancy is still flat. Stay tuned. 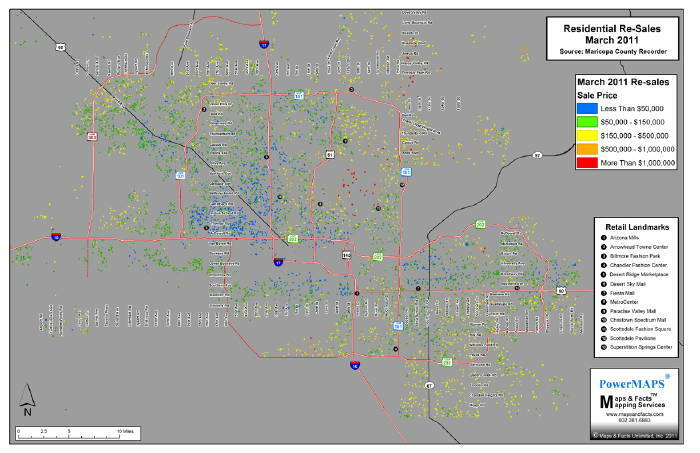 Our December 2008 Map of the Month depicted the 5000 + Lender Owned Properties (ARMLS Listings) in Maricopa County. This month’s update depicts only about 3,000 Lender Owned Listings (LOL): a decline of about 2,000. 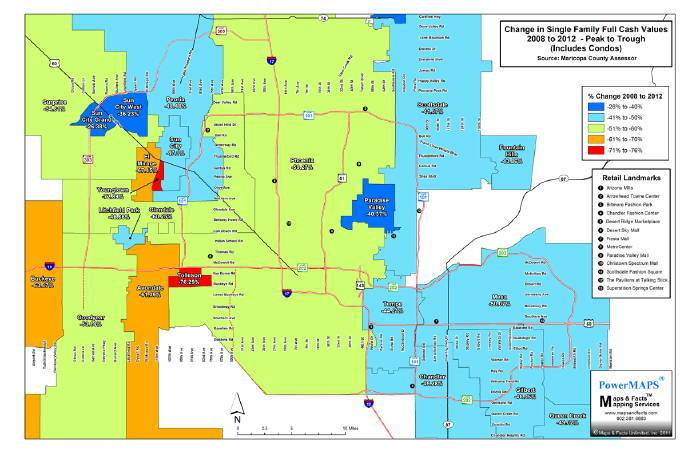 Interestingly, at least 1,500 of the 2,000 are located west of I-17: a 75% reduction from the 2008 numbers. Our take is that the spot decline in LOL’s from 5,000 to 3,000 is very good news especially for the west side of I-17, and, for entry level priced housing which is the foundation of the housing pyramid. 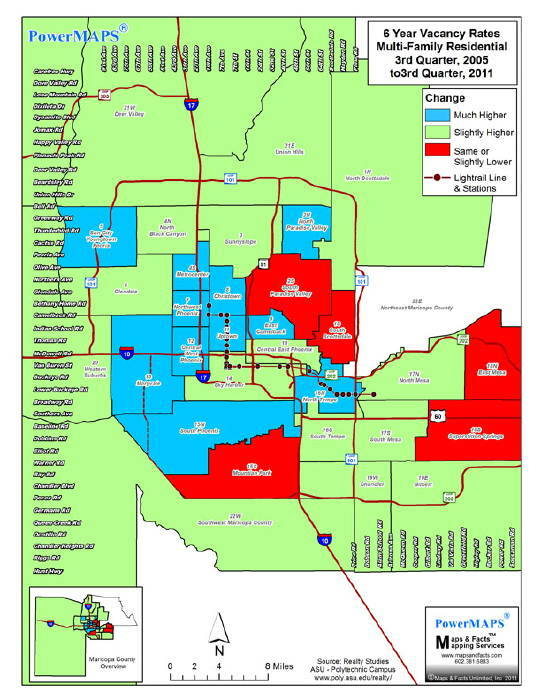 The bad news is that the LOI’s to the east of I-17 only declined by 25%. Again, our take is that median prices east of I-17 are generally higher and therefore harder for investors to cash flow and harder for qualified buyers to finance even at today’s historically low interest rates. This is just a snapshot, but it portends improvement for all classes of real estate. If you are new to Map of the Month, this is our 41st monthly map! Many of our maps are proxies for real estate and demographic trends. If you have a particular subject you would like mapped, call and we’ll see what we can do. Others may have similar interests. Six (6) were office, two (2) were industrial. Five (5) were 54% or less occupied. The predominant Buyer Profile was a regional, national, or Canadian REIT or Equity Fund. Institutionally, Phoenix is still in intensive care. 2010 Population "Inside the Loops"
Now that the 2010 Census data is slowly being released, we can start to map a few highlights! 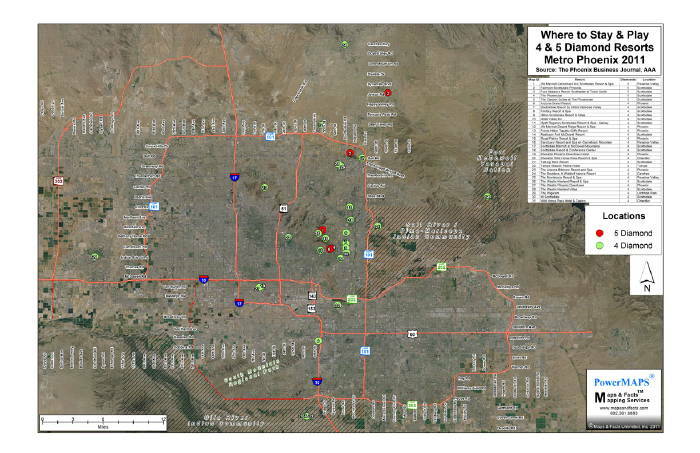 This month's map shows the 10 census tracts with the highest 2010 population counts inside the 2 major freeway loops (101 & 202). Because census tract size is a function of population, not all census tracts are the same geographic size. 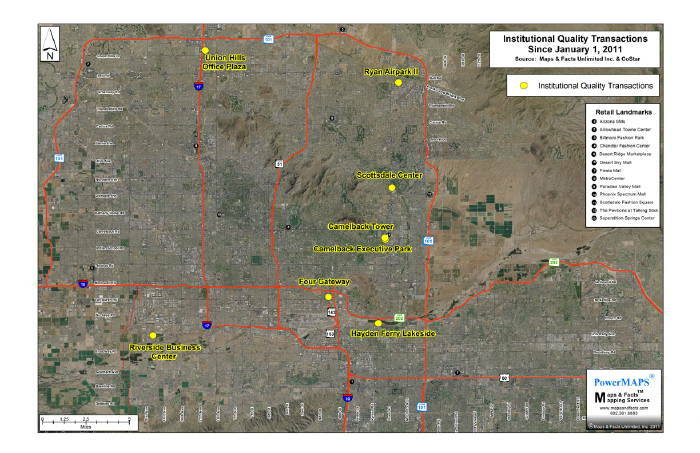 Most are 1 square mile but notice the 4 square mile tract in the East Valley and 3 square mile tract in the West Valley. 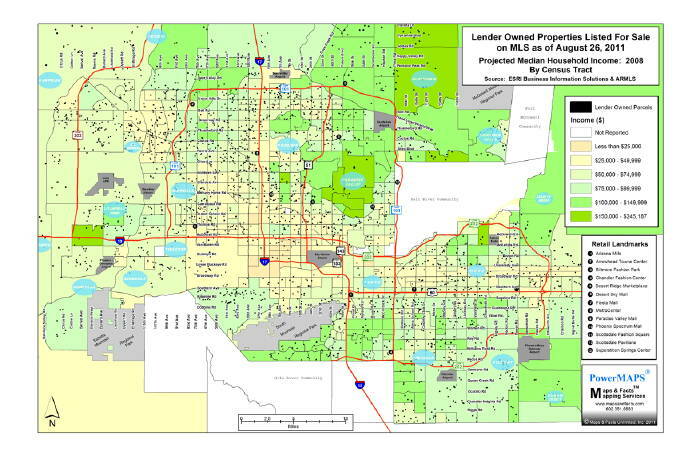 We tried to stay "Inside the Loops" where most of the census tracts are 1 or 2 square miles. As we all know, AAA ranks hospitality venues by Diamonds. They just added Three (3) new Four (4) Diamond properties in the Valley. There are 124 Five (5) Diamond Resorts in the US. Only 3 have had their Five (5) Diamond status since ranking began 35 years ago! The Broadmoor, The Greenbrier, and our Camelback Inn! The Five (5) Diamond Phoenician & The Canyon Suites at the Phoenician have two (2) Four (4) Diamond Restaurants on property. All of the Five (5) Diamond Resorts have at least one Four (4) Diamond Restaurants and golf courses on site or in close proximity. Not All Apartment Markets Are Coming Back! For several years now, the national and local real estate press have been championing the strong return of the apartment market. In keeping with our interest in small area analysis, we have mapped the change in apartment vacancy rates from the 3rd quarter 2005 to the 3rd quarter 2011; 6 years. Obviously, there have been changes in inventory but the pattern is clear. 5 districts are now at or below their 2005 lows. Probably no surprise there. However, the other 25 districts still have higher vacancy rates, some much higher, i.e. 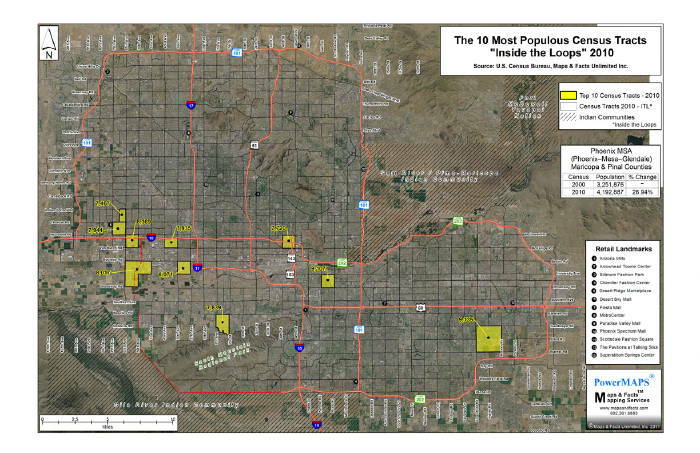 Northwest Phoenix and Uptown, districts where the apartment inventory is older and perhaps "tired". Location still matters!